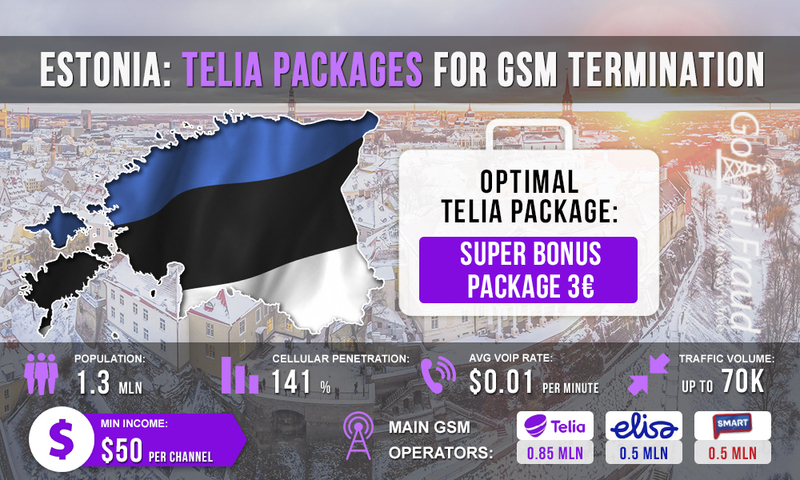 Telia is the leader of the cellular sector in Estonia. This is the largest mobile operator in the country who owns about 42% of the entire local subscriber base. Telia starting plans will be the best choice for profitable voice traffic termination. We will help you figure out which operator’s tariff plan will be most suitable to work in this area. 3 Euros. Topping up your account with $3.4 and more, the client receives bonus minutes — 6000 within the network and 150 for other networks. Duration - 1 month. 8 Euros. Topping up your account with $9 and more, the client receives bonus minutes — 15000 within the network and 250 for other networks. Duration - 1 month. The topping-up sum ($3.4 or $9) starts to be used only after the bonus minutes have finished. Simpel 4. It provides 3000 minutes for calls within the network. The cost is $4.5. Simpel 9. Provides unlimited calls within the network and 600 minutes for calls to the other operators’ networks. The cost is $10.2. The best choice for earning on landing of voice traffic is a 3 Euros plan. With this offer, the minute of the call will cost you about $ 0.005 (if the gsm gateway illegal will run for 10 hours a day). The Terminator's earnings will be about $50 (from one GSM port).